Hardly anyone is born with model-building talent, so we all must learn how to do it. What else is required? The author describes how he built this model using a Hoquat Hobbies S-scale steeple-cab electric locomotive body kit, a powered Athearn HO-scale SW-7 switcher, and a variety of detailing parts from three different scales. Includes close-up photos, construction diagrams, and a parts list. A brief summary of the event, and several photos taken there. The show is reviewed, and includes a couple of photos taken at the event. The author starts building the Backwoods Miniatures' kit, which is based on a freelanced design. It shows the kit's parts, a few early construction photos, and photos of the company's other locomotives. Using a Weller 200W soldering iron to convert it into a foam cutter. The author reviews this kit produced by banta modelworks. Includes a couple of photos of the finished model. The author had his layout open during the regional NMRA tours. 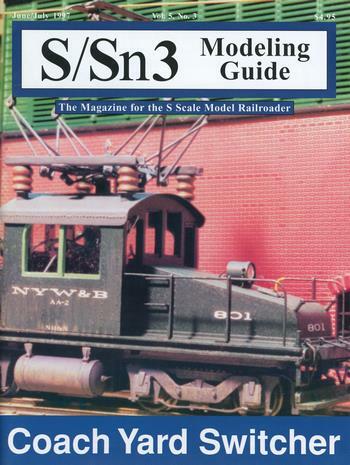 His was the only S-scale on the tour, and he describes his experiences, what he enjoys about going on layout tours, and offers a list of things to think about when you open your layout for a tour.